A stab vest could save your life one day ! A stab vest is usually used by law enforcement and army officials to help protect them during combat. A stab vest is essentially a reinforced article of clothing, usually worn under or other regular items of clothing, which is specifically designed to resist knife attacks to the chest, back and oblique's. Stab vests are different from regular bulletproof vests, which offers mainly protection against bullets from firearms but afford very little protection against stabbing from sharp objects such as knives. Stab vest typically do not protect against bullets, especially those of high caliber. They are instead designed to prevent serious personal injury by preventing knife penetrations that go further than a few millimeters. Stab vests can be used in areas where crime is unusually high. While they are primarily aimed to be used by law enforcement officials, there are many individuals who use stab vest on a day-to-day basis. Perhaps you know someone that is after you and you want to protect yourself. Perhaps you are a victim of domestic violence and have a sick, twisted stalker ex or ex-husband that is after you. Or maybe you have a psycho girlfriend that can pop up at any moment with the intention of stabbing you! The are all out of the ordinary situations, but they do occur, believe it or not! Security personnel at businesses and at local nightclubs might also have great use for such stab vests. Especially in the club scene, it is not unusual for psycho's to be walking around getting in fights or trying to stab people they have conflicts with. Stab vests are manufactured by the American Company called Concorde. They make them mainly for the U.S. Military. The vests are typically fully adjustable at the sides and at the top for the shoulders and come with complete extra protection for the stomach area. The oblique's (sides of the stomach) are also fully re-enforced and protected. It is important to note that these vests have no guarantee of performance. They are tried and tested against knives during manufacturing. They are often sold in large quantities to local club doormen and door women. Establishments such as these typically order large quantities of stab vest for the personnel. Ideally, you will also find many bodyguards of celebrities or important persons wearing these types of vests. Some stab vests come fully equipped with pockets for carrying objects such as pepper spray, stun guns or taser guns. Stab vests can also be ordered for doctors, nurses and even teachers! High schools are becoming increasingly dangerous as crime in these areas have been on the rise, especially in the past 10 years. There has been record-breaking school massacres occurring over the past decade! If teachers can now go to school with stab vests, they can greatly help prevent such an incident from happening in the future. Even if the perpetrator might come to school with a gun, the teacher can still help isolate the incident by more confidently attacking the dangerous student to disarm him. With stab vests, even a shot to the chest is less severe. While they are not designed specifically for gun shots, they can make the disaster of being shot much less severe. 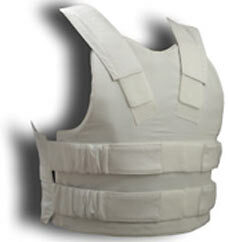 Obviously if someone is shot with a gun, the stab vest will help penetrate some or most of the shock from the bullet. It is a much better option than not wearing any protective gear at all, since then the bullet would simply penetrate the skin initially and not have a barrier of any kind to go through first! If the assailant has a gun and tried to stab the teacher, the stab vest will then offer almost 100% protection for the teacher. This will give him/her enough time to help stop the suspect from wreaking further havoc. So what's gone wrong? 10 years ago it was not like this. Have people just gone crazy lately? Well so it seems! The U.K.'s government has plan to distribute stab-proof vests to public service staff which might include doctors, nurses and teachers, to help protect them in the line of duty. This alone is a sure sign that the nation is failing, as far as safety and sanity of the environment goes. Organizations such as schools especially, can benefit greatly by employing the use of these types of vests by teachers. With the recent horrific events such as Columbine and other school's all around the world, it's easy to see why such stab vests might actually be a great idea. Students are often faced with much adversity these days and a student that may get teased a lot might come to school one day and take out all his vented frustration on the entire school. They might come to school with weapons such as guns or knives with the intention of hurting innocent bystanders. If the teachers all wear stab vests, then future disasters such as Columbine can be avoided. Copyright (c) 2008 Stab vest. All rights reserved.